BEACON — A portion of Beacon's waterfront that was largely contaminated less than a decade ago was the site of a celebration Saturday. The land, purchased in 2001 by the nonprofit group Scenic Hudson Inc., has been transformed into a multi-use arts and recreation area called Long Dock Park. The 15-acre park officially opened Saturday afternoon, and hundreds strolled the grounds just south of the Metro-North Railroad Station. Some paddled kayaks in the Hudson River, while others enjoyed food and live music near a new dock that juts out into the river, offering views of the Catskill Mountains to the north and Storm King Mountain to the south. Scenic Hudson President Ned Sullivan called the new park a "demonstration of the power of partnership." The land, once a major rail yard and more recently used as a bulk oil storage facility, was restored with $8.5 million in public and private funding, Sullivan said. "We bought the land, then we asked the people of Beacon what they'd like to see here," he said. "What we're seeing is the result of that collaboration." A 150-year-old building on the site has been transformed into a gallery and other facilities run by Mill Street Loft, a Poughkeepsie-based arts group that runs cultural and educational programs for children and adults. Mill Street Loft Executive Director Carole Wolf called her agency's partnership with Scenic Hudson "a logical marriage of the arts and the environmental movement." Sullivan said plans have been drawn up for a hotel and conference center on part of the site that will employ "the latest green technology" in its building methods. The project is on hold pending the region's economic recovery, but Sullivan said he was confident it would be built. U.S. Rep. Nan Hayworth, R-Mount Kisco, whose district includes parts of Dutchess County, was one of the first to enter the park when the festival began Saturday afternoon. "This park shows why Scenic Hudson is such a special organization," Hayworth said as she toured the Mill Street Loft art gallery. "It will be a benefit not only to the people of Beacon but to the growing number of tourists who are coming to the Hudson Valley." Beacon resident Kevin Sheffield called the new park "just the latest example" of improvements to the quality of life in the city. "I moved here from Queens three years ago, and ever since then I've seen one amazing thing after another happening here," Sheffield said. "I tell everyone I know they really have to come to Beacon and see what's going on." Reach Larry Hertz at lhertz@poughkee.gannett.com or 845-437-4836. 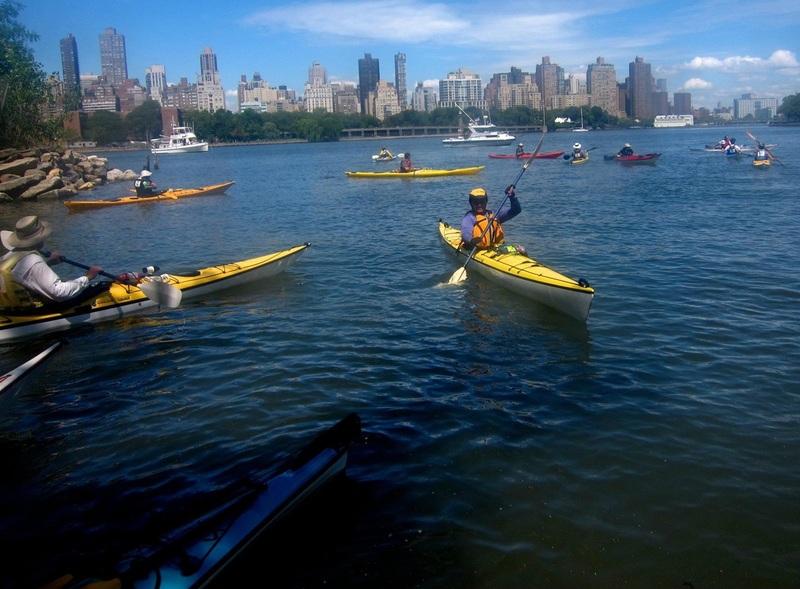 Liberty State Park this morning began its summer program of free kayak eco-tours of the surrounding Hudson River Estuary. The tours, which are about two hours, highlight the many birds and other wildlife that call the waters home and focus on their habitats. No paddling experience is necessary to take part, but you’ll need to be comfortable being out in somewhat deep waters. The tours are open to adults and children over 16, but those under 18 need to be accompanied by an adult. Tours embark from the canoe/kayak launch located at the south side of Liberty State Park, near the park office, and they highlight the local wildlife and habitats of Caven Point. All trips are from approximately 10 am to noon (participants are asked to arrive at 9:30 am) and include a brief safety and paddle instruction. Pre-registration is required; to do so, contact the Liberty State Park Interpretive Center at 201-915-3400 or lspic (at) verizon.net and provide the date you are interested in, your name, age (if under 18), email and a phone number at which you can be reached in the event of program cancellation. You will receive a confirmation, directions and any further information at that time. Since the program is free, you’re only allowed to register for one kayak trip each summer. In July: 6th (Wednesday), 7th (Thursday), 9th (Saturday), 10th (Sunday), 12th (Tuesday), 13th (Wednesday), 14th (Thursday), 19th (Tuesday), 23rd (Saturday), 24th (Sunday), 25th (Monday), 26th (Tuesday), 27th (Wednesday), 28th (Thursday) and 31st (Sunday). In August: 3rd (Wednesday), 4th (Thursday), 6th (Saturday), 9th (Tuesday), 10th (Wednesday), 11th (Thursday), 13th (Saturday), 16th (Tuesday), 21st (Sunday) and 30th (Tuesday). A NEW ANGLE: Kayaking on New York's waterways lets you notice things you'd never see from street level. It hardly needs saying that the Manhattan skyline is spectacular from pretty much any angle. But sitting just above the bobbing waters of the Hudson River adds a whole new perspective. From a kayak, New York looks profoundly intimidating. The race for the sky can be put in context: hundreds of separate developments trying to put their own brush strokes on an already hyper-detailed canvas. There's a temptation to just stare at it and let your paddle slide off towards the Atlantic. Kayaking isn't the most obvious form of transport in New York. Instinct says the water is liable to be far too cold and the waterways are likely to be far too busy. The former is inaccurate, in summer at least, although it starts to get interesting once you attempt a pier-to-pier dash across a busy ferry terminal. We have small lights on the fronts of our vessels but there's a strong suspicion a ferry pilot will mistake them for reflections of moonlight on the water and mow on straight through. As such, the chicken run becomes a judicious exercise in granting right of way and waiting for a gap in the traffic. From the boathouse on Pier 66, numerous options are available. Our guide, Alex, says it would take eight or nine hours to circumnavigate Manhattan, "depending on how strong your arm muscles are". Another popular option is to do a loop around the Statue of Liberty, which takes about three hours. My group isn't that ambitious; we're going for a 90-minute after-dark paddle. It's an opportunity for an unusual perspective on the city, with the sun down, skyscraper lights on and the water a murky black. I'm regarded as intermediate purely because I've been in a kayak before, while my cohorts - native New Yorkers - are absolute beginners. But part of the joy of kayaking is it's pretty easy to pick up the basics. Soon enough, the group is gliding in convoy, awed by the sun setting over the New Jersey skyline and the lights sparking into life on Manhattan's skyscrapers. Of these, the most striking is the Empire State Building. The top of it is lit up in lurid colour. Other, lesser-known buildings stand out, too. One Worldwide Plaza looks like a giant fat pencil - its sharpened end is lit up in a moody blue, with the lead at the end acting as a yellow beacon. Also illuminated is the USS Intrepid, an enormous decommissioned aircraft carrier that monopolises Pier 86, further up the Hudson. Sidling up alongside it, we realise the ferries are just small fry. Ferries aside, kayaking on New York's waterways is remarkably peaceful. You start to notice things you'd never see from street level. Take, for example, the night sky. On first glance, it appears sprinkled with stars. Then you notice the stars moving and make a mental note to never apply for a job at air traffic control in New York. The "stars" are, in fact, scores of circulating planes. They appear to be spiralling in formation, like water going down a sink after the plug is pulled. never sleeps but gently rocking on the Hudson, it appears to be at rest. The writer was a guest of NYC & Company. 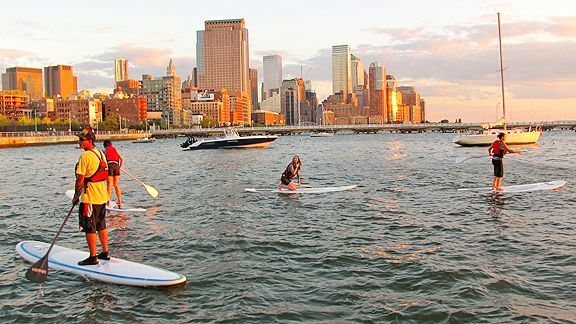 The Manhattan Kayak Company offers a variety of tours, with timetables available on its website. The sunset tour costs $65 ($NZ84), bookings are advised. +1 212 924 1788, manhattankayak.com. More actively inclined children will love the kayaking trip but younger ones and those prone to moaning about a bit of hard work are probably better off going on other adventures. Views out over Manhattan are also available from the rooms at the Affinia Dumont (www.affinia.com, +1 212 481 7600) hotel. It's a stylish, well-located Midtown joint with suites available from US$249 ($NZ321) a night.